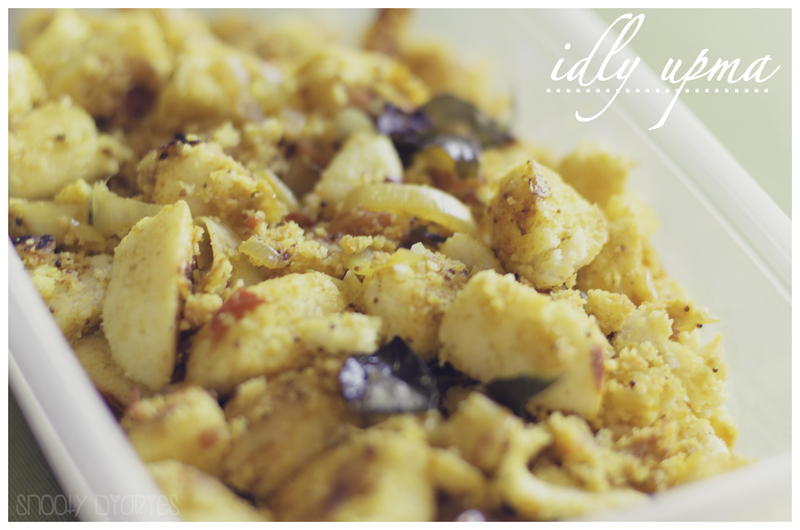 Idly Upma or Masala Idly is one of my all time favourite Indian dishes. Its so quick and easy to make, fits in with all the meals, you can have it for breakfast, lunch, or as a snack, low in calories and above all ITS YUMMY. It is the best way to utilize the leftover idlies. To avoid making idlies altogether, you can buy the ready-to-eat pack from any Indian store in your area. They are easily available and equally good. The one I use is ‘Udupi Rawa Idli’ by Deep. 1. Heat oil in a heavy bottomed pan. Add curry leaves, turmeric powder, mustard seeds and dried red chili. When the seeds start crackling, add onions and ginger paste. Saute them till they are soft and tender. 2. Add the tomatoes, salt and coriander powder. Let it cook till it starts leaving oil. 3. Add the idlies to the pan, mix well and turn the heat to low. Saute them for 2-3 mins. Cooking time – 15 mins. Total time – 20 mins. This entry was posted in FOOD, indian, Recipes, snacks and tagged FOOD, idly, Idly Upma, Indian cuisine, masala idly, south indian. Bookmark the permalink.